The chair dip exercise targets your triceps and pectoral (chest) muscles. To perform this exercise, you will require a sturdy chair, preferably without wheels, that you can balance against. Sit on the edge of a chair with palms against the seat. Make sure that your hands are shoulder width apart. Lift behind off the chair and move your feet forward. Maintain a straight posture, head up, chest raised. Make sure that your knees are not bending past your toes. 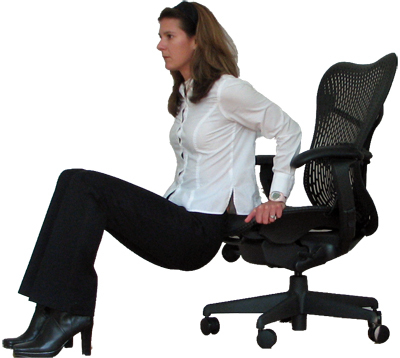 Slowly lower your body off the edge of the chair. Make sure that your elbows maintain a 90 degree bend and no lower. When raising your body to the start position, support your weight with your arms. When extending your arms, keep as straight as possible without locking your elbow. Perform 6-8 repetitions per set. Beginners should start with only 1 to 2 sets of 6-8 reps. Sets are determined by fitness level. More conditioned trainees should increase their reps to 10-12 per set with a minimum of 3 to 5 sets. This combination will give you the body you've dreamed of! Aside from being a great strength-training exercise that tones the upper body and arm muscle groups, chest dips naturally increase the appearance of your breasts by increasing the pectoral muscles. Pectoral muscles are located beneath the breast tissue, and the firmer and toner these muscles are, the more they elevate the breasts, increasing the appearance of your cup size. Remember – these exercises will be most effective when combined with Perfect Curves breast enhancement capsules and Perfect Curves gel. Order Perfect Curves today – let us help you make your dream come true.